I made this for dessert last week. It came to me after watching too many episodes of "Chopped" on Food Network. "Pain perdu" is the French term for French toast (literally, "lost bread"). It is a staple for all culinary students (myself included) and has started to show up more and more as a dessert base. Here I used a whole wheat challah, which has a nice, fluffy texture and slight sweetness. The egg wash had a splash of almond milk and vanilla. 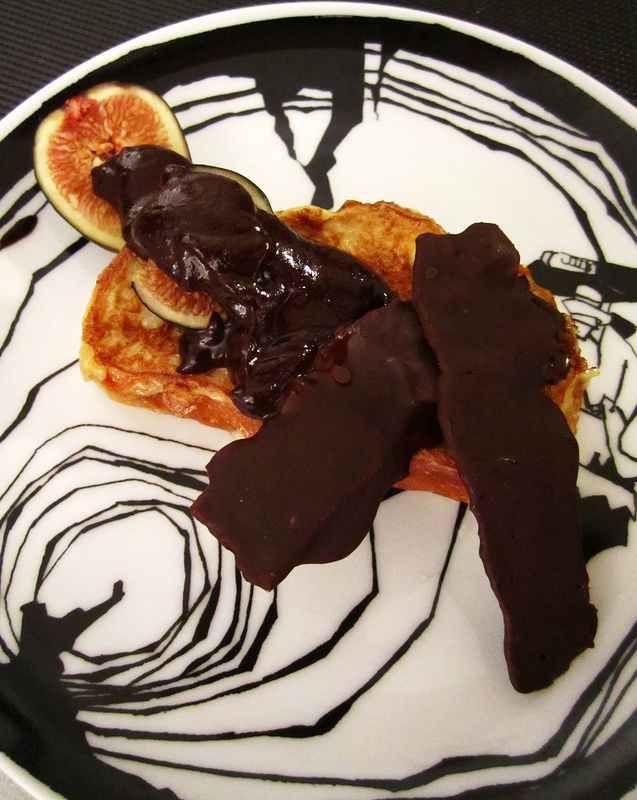 To dress is up, we used ripe black Mission figs drizzled with a melted 85% dark chocolate and then garnished with 2 slices of dark chocolate bacon strips. Yes, bacon. So basically, it's a grown-up take on breakfast as a dessert. Lots of textures, and wide flavor profile. Yum! Mix the eggs, milk and vanilla well in a shallow bowl. Slice the challah top to bottom - each bun should yield 3 slices. soak in egg mix for about 30 seconds per side. Heat 1 Tb oil in a skillet over medium-low heat. Gently place the bread into the pan and cook until just browning, then turn and repeat. Meanwhile, heat the chocolate, butter and milk in a glass measuring cup or bowl in the microwave on high for 12 seconds. Remove and use a spoon to mix and melt the chocolate. If not quite hot enough, run for an additional 10 seconds only and try again. Too much microwave will burn the chocolate quickly. Serve with cut figs, drizzled with chocolate and a side of bacon - it's breakfast updated for dessert!